Remember the amazing images of an avalanche on Mars back in March of this year from the HiRISE camera on the Mars Reconnaissance Orbiter? If not for two geologists studying landforms in Alaska, MRO scientists might not have been on the lookout for such an event, or may not have known what they were seeing. A serendipitous week-long trip to Alaska by Craig Kochel and Jeffrey Trop, geology professors at Bucknell University, helped them predict one of the most important, and breathtaking planetary observations ever made. Witnessing an avalanche, or landslide in action on Mars has helped us realize the Red Planet is still a dynamic, ever-changing planet. The two geologists were in Alaska for an eight day trip in July 2006, studying geological features and the processes that create them. In preparing for the trip, they looked at photographs of the area they would be hiking through and noticed several features in the photographs that looked familiar. Kochel thought they reminded him of images heâ€™d seen when working on the Viking missions to Mars in the 1970s. In both the photographs and while they were hiking they saw triangle-shaped landforms called “fans” that especially looked like features on Mars. But, at first they didn’t know what they were. During their short time in Alaska they saw over 200 snow, ice and/or rock avalanches. They realized these events were creating the fan-like features in Alaska, and determined similar avalanches on Mars were creating those same features. Additionally, they believed avalanches could still occur on Mars due to changes in temperatures from sunlight hitting a cliff wall. At a presentation at the Lunar and Planetary science conference, Kochel and Trop shared their findings and explained that with a bit of luck and good timing, it would be possible to snap photographs of Martian avalanches. Amazingly, soon afterwards the orbiter sent back images of an ice flow avalanche in action on Mars. Pieces of ice, dust and possibly rocks crashed down from high, steep areas, sending clouds of fine material billowing upwards. The cloud itself was about 180 meters across. The exact cause of the avalanche isn’t known with certainty, but it could be because the sun warmed layers of ice. This was the first time an avalanche had been observed on another world, and was the perfect confirmation of Kochel and Trop’s ideas. Studies like this show that although Earth and Mars are very different places, in many ways they can be astoundingly similar. 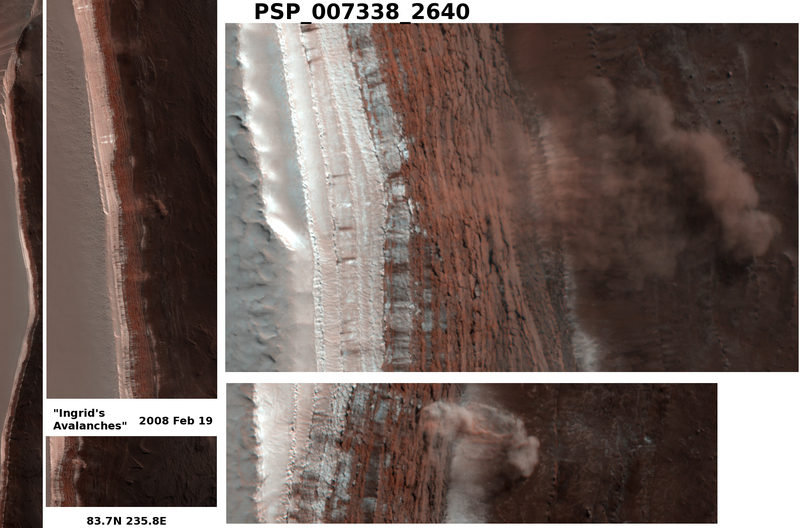 Here are more images of the Mars Avalanche. Bet they’re happy with that! !